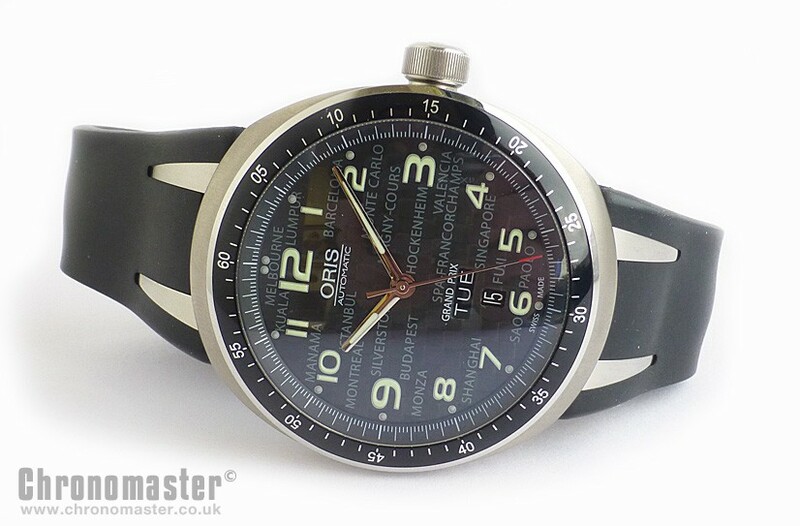 Oris TT3 Grand Prix, complete with box and papers, originally bought from Goldmiths in Leicester in 2009. 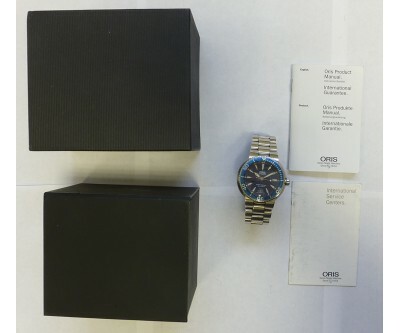 It is a Limited edition and limited to only 1,800 pieces. The significance of 1,800 is that this is multiplication if the 18 Formula 1 race circuits across the world. This one is number 1,690 out of 1,800. 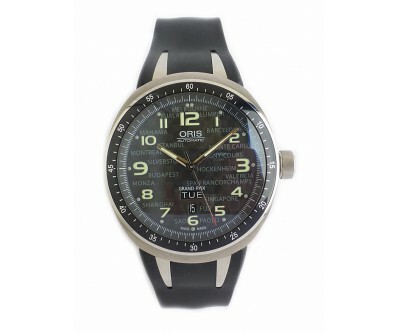 The Oris TT3 Grand Prix is the ultimate race track companion. The TT3 Grand Prix Limited Edition has been specifically designed with the motor sport enthusiast in mind. With high tech style and High-Mech quality it’s all set to be a new champion. 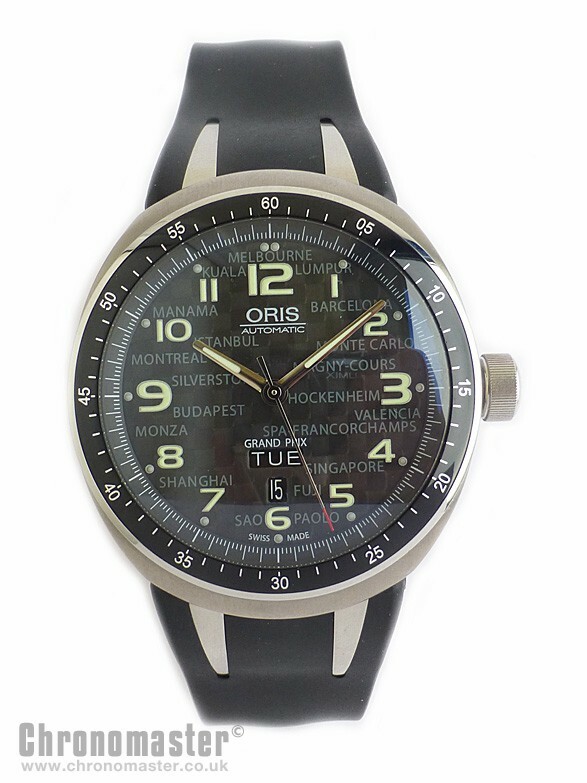 The 18 race tracks of the 2008 Formula One season are printed discreetly in grey on the black dial to make it the ultimate race track companion. The pictures have been taken to pick out the text, in reality the text is more subtle. The case is a multi-piece titanium case with minutes scale fixed bezel. 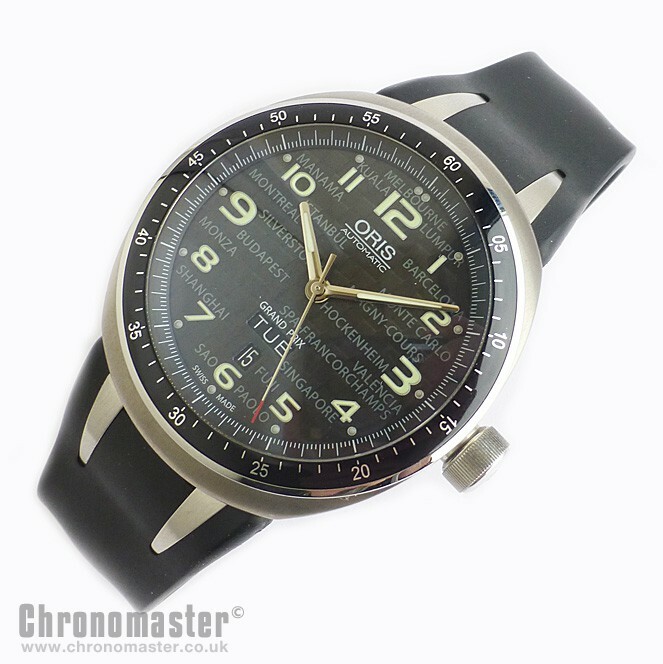 It has got long extended swiveling lugs onto the rubber strap. 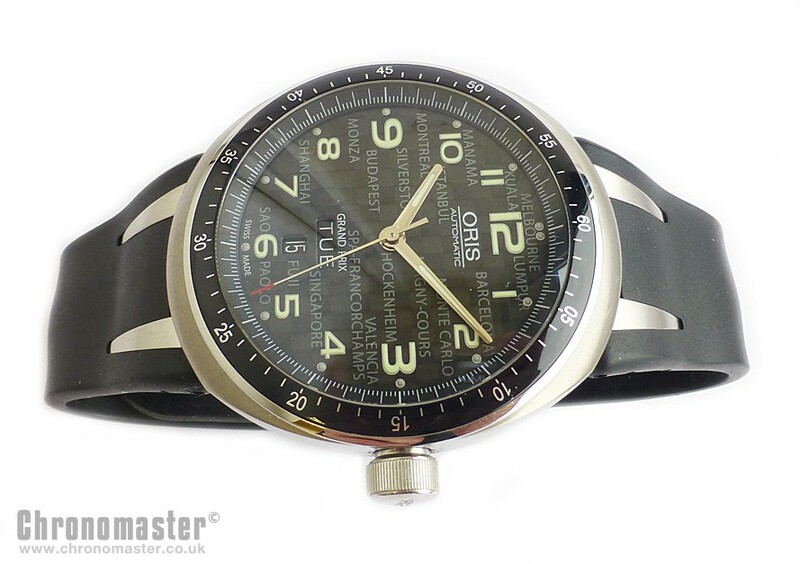 The strap is reminiscent of Formula 1 race car tyres. It has got applied luminescent numerals. 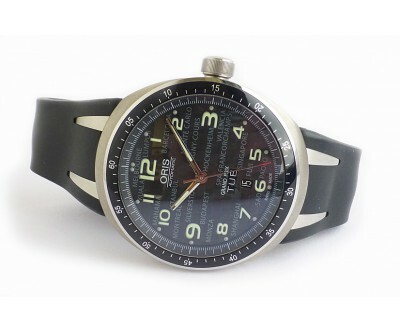 The dial is printed with the names of the 2008 Formula 1 circuits on a carbon dial, polished dial. The hands are polished nickel with luminescent inserts, screwed-in case back, see through case back, curved sapphire crystal. 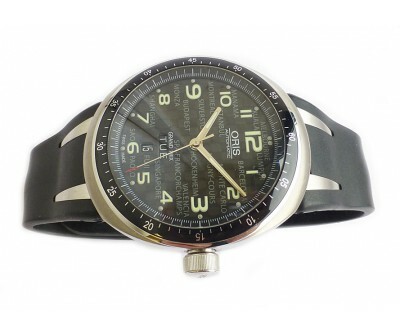 The watch is water resistant to 10 bar which is approximately 100 metres. Has a large and functional looking non screw down crown. 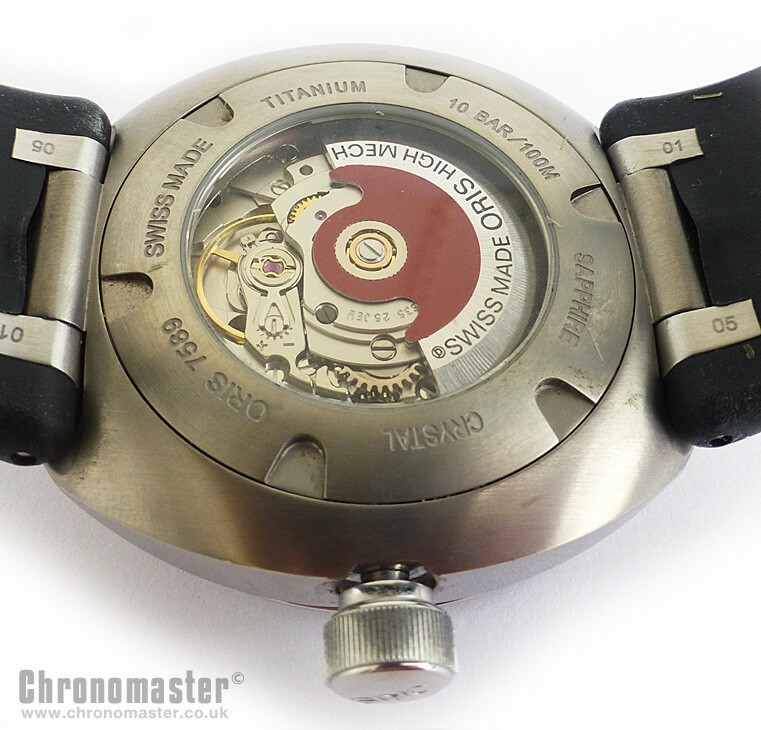 The movement is a Swiss made 25 jewel Oris 635, base ETA 2836-2 vibrating at 28’800 A/h, 4 Hz. Centre hands for hours, minutes and seconds, individual date and day windows, instantaneous date and day, date and day corrector, fine timing device and stop-second hand for accurate time setting. 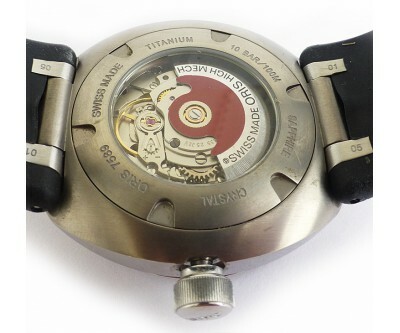 The winding is Automatic winding, bi-directionally rotating red rotor. 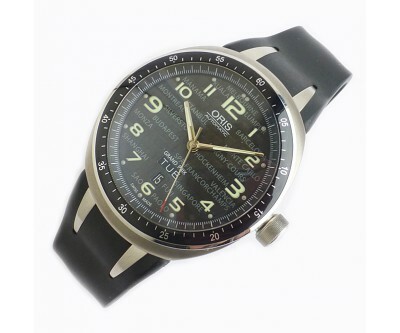 It has got a very comfortable soft silicone rubber strap which is made more comfortable by the presence of the swiveling lugs so it fits easily and comfortably around the wrist. It has got a double push button signed titanium folding deployant clasp with small buckle, the clasp is easy to adjust on the rubber strap. 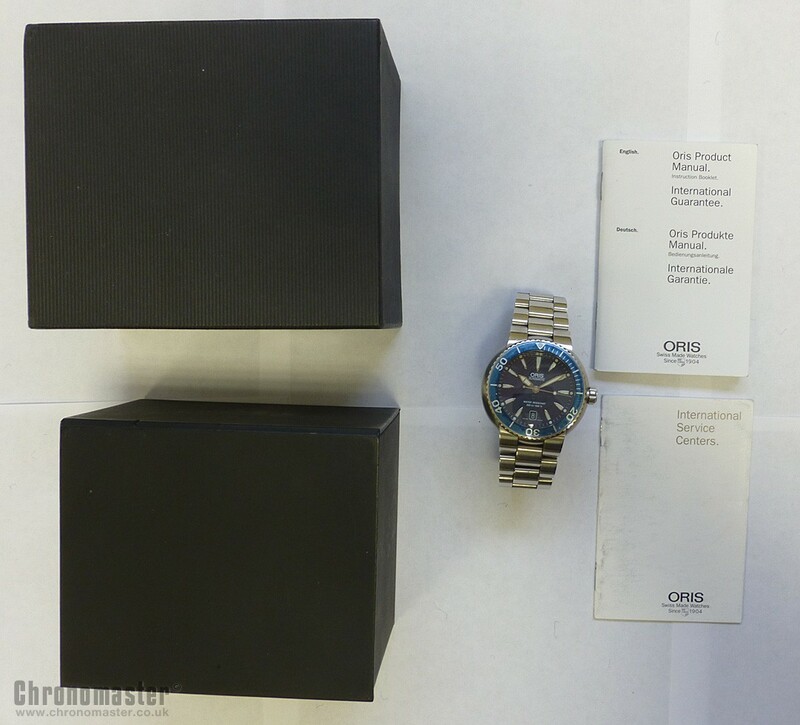 It comes in the standard Oris presentation box, it was originally purchased in 2009, so just two years old. Dimensions are as follows: Width is 44 mm excluding the crown, 48 mm including the crown, top to bottom is 49 mm and thickness is 13 mm.